To all of you, we dedicate this vision of ours, created to honor the sublime minds of Galileo and Giotto, who both found in the land of Padua comfort and welcoming for their own visions, superbly projected beyond the common horizon. May it inprint in you vigor, audacity and the deepest breath to enter the gates of the new coming Era. Brightest whishes for 2018 from the PHOTONIKA Team. 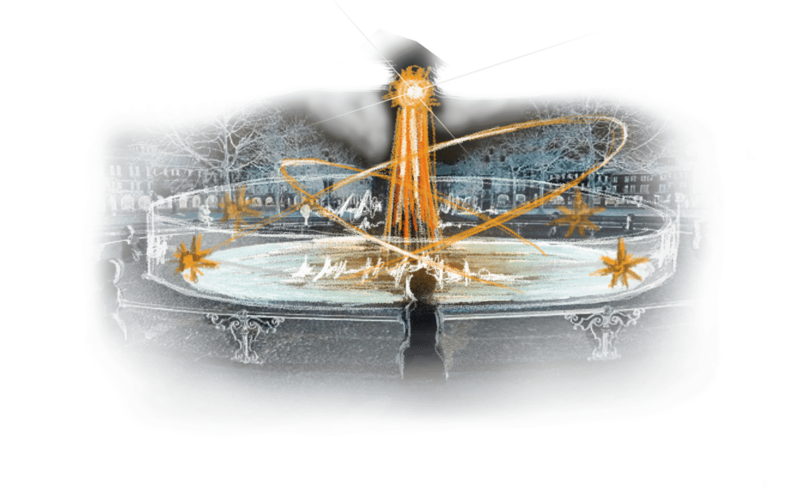 This concept has been created on commission by the Camera of Commercio di Padua for the occasion of the Christmas Holidays 2017-2018 and the concurrent event Padova Space Week. It is inspired by the genius of the two renowned italian characters, and in particular to their peculiar and still revolutionary vision, which is both oniric and scientific. The installation has been thought at the very core of Prato della Valle – the second biggest square in Europe – where the fountain is transformed in a luminous telescope – the extraordinary invention that Galileo introduced to the Venice Governement in 1609 – at center of which materialises Giotto’s famous falling star – part of the grandiose painting in the Cappella degli Scrovegni in Padua – aimed towards the deep space as a message of prospeous evolution. A masterly game of moving lights, then, simulate the aperture and the closure of a huge photographic diaphragm, which scans the rythmical sequence of galileian quotes, projected on a perimetral membrane set around the big lens of the telescope, meant as ethereal inspirations for the visitor. And, obviously, it is also inspired to the spectacular dynamics of the Cosmos, of which Galileo and Giotto’s open-mindedness is a glorious echo. The installation has by now remained a concept, waiting for an era as revolutionary as the one Galileo and Giotto could fortunately enjoy.